Love is in the air for the Facebook Data Science Team, as it is devoting Valentine’s Day week to a series of blog posts analyzing related trends among the social network’s users. The first installment, written by Mike Develin, focused on religion. The rate of interfaith relationships is low across the globe, with Spain having the largest percentage of relationships between two people of different religions, at 28 percent. 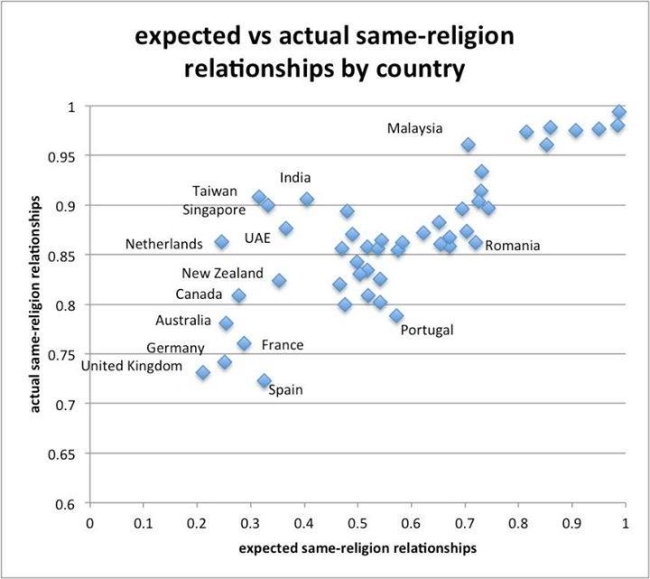 The U.K. featured the lowest rate of expected same-religion relationships, at 21 percent, and the second-lowest rate of actual same-religion relationships, despite being a melting pot, with 40 percent of users in Facebook’s sample Protestant, 17 percent Catholic, 15 percent atheist, and 11 percent Muslim, showing that most residents there stick to their faiths when it comes to relationships. The same is true in other countries, including Singapore and Taiwan, where more than 90 percent of relationships are between partners with the same religion, despite those countries featuring diverse mixes of religions. However, the opposite is true in Romania and Portugal, which featured comparatively high rates of interfaith marriage despite being dominated by single religions (Christian Orthodox in Romania, Catholicism in Portugal). 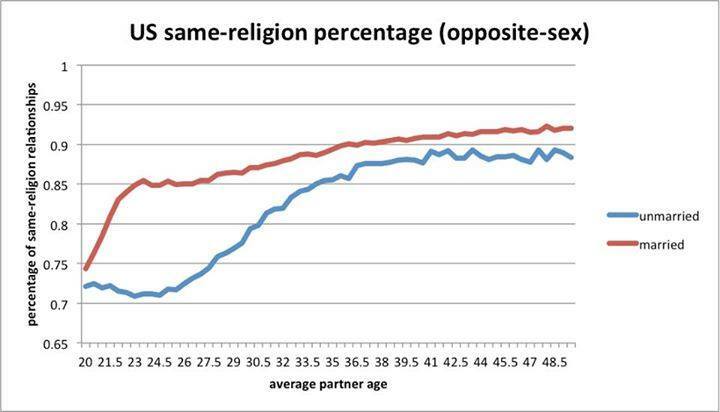 Overall, people seem more willing to date people of different religions than to marry them, especially when they are in their 20s. 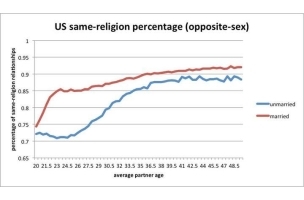 In the U.S., 86 percent of overall relationships are between people of the same religion, but at age 25, 85 percent of marriages fit that description, while only 72 percent of unmarried relationships do. 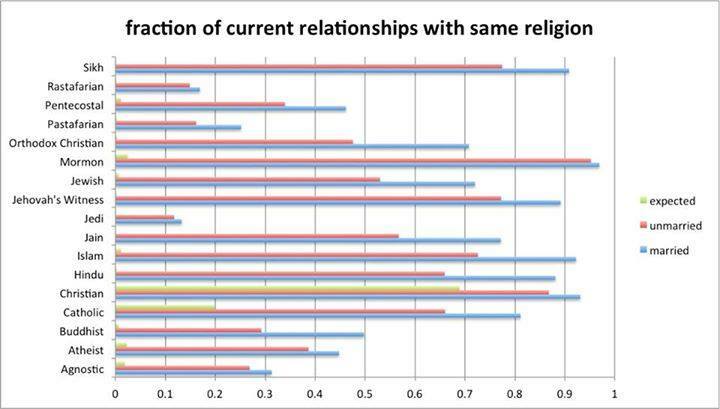 Results vary strongly by religion, as Mormons and Sikhs are far more likely to marry or engage in relationships with partners of the same religion, while Jews are much more prone to intermarry. Readers: Did any of the findings by the Facebook Data Science Team surprise you?